Andrew Trask, a 2015 Belmont graduate with a B.S. in Applied Discrete Mathematics and B.B.A. in Finance, is the featured guest on the March 21 episode of This Week in Machine Learning & AI (TWIML&AI). 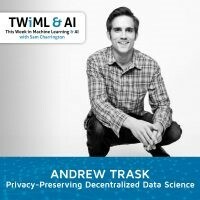 Ranked among “The 10 Best AI, Data Science and Machine Learning Podcasts” by Medium.com, TWIML&AI hosts weekly conversations with researchers from Facebook, Microsoft, Google, as well as other leading corporations and universities on the cutting edge of machine learning and artificial intelligence. Trask, currently a Google DeepMind Scholar and Ph.D. student at Oxford University, is the author of Grokking Deep Learning, which teaches readers to build deep learning neural networks from scratch. Trask is also the coauthor of the Udacity Deep Learning curriculum and founder of the OpenMined project, an open-source framework that will allow developers to gain insight from users’ data without compromising their privacy. His conversation begins with a generous shout-out to Belmont University. The entire episode can be heard online here.